Take traditional shepherd’s pie to a whole new level! 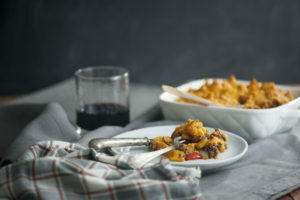 This homey and hearty Spicy Sweet Potato Shepherd’s Pie comes together with little fuss and is sure to tantalize everyone’s taste buds. For the topping, in a large pot, bring 6 cups water, potatoes and ½ teaspoon sea salt to a rolling boil. Boil for 10 minutes or until potatoes are fork-tender. Drain potatoes and use an electric mixer to combine potatoes, butter, milk, remaining ½ teaspoon sea salt and pepper. Meanwhile, in an oven-safe pot, cook and chop ground beef until browned. * Drain excess fat from pan, if needed. Add onion, peppers, garlic and spices. Continue cooking until vegetables begin to soften, about 3 minutes. Stir in tomato paste, canned tomatoes and beans, if using, and simmer, 3 minutes. Spoon or pipe topping onto base and bake for 15 minutes, or until topping begins to brown. *If you’re not concerned about keeping the dishes to a minimum, you can make the base in a stockpot and transfer to an oven-safe serving dish before topping with sweet potato mixture and baking. Recipe and photo courtesy of Angela Sackett.